In pursuit of a glorious thee. Our volunteers will be at the parking lot of the Dr. Juan dela Cruz Medical Specialists’ Clinic at 480 Boni Ave., Brgy. New Zaniga, Mandaluyong City (in front of Shell gas station) on April 22 to receive donations. You may drop by and bring your recyclables anytime between 10AM to 3PM. We will be announcing the venue of other drop-off points, on the succeeding weekends. We can also arrange for a meet-up or a pick-up at a location and time more convenient for you. Please send as a message through e-mail (pisay96@gmail.com) or mobile (09204469728). You may also contact anyone from Pisay 96 to set a schedule. We can also collect recyclables from your offices. If you’re interested, let us know and we will send a letter to whoever’s in charge, asking for your office’s used paper and other junk. We look forward to your usual support. Please help us spread the word by sharing this note to your friends. 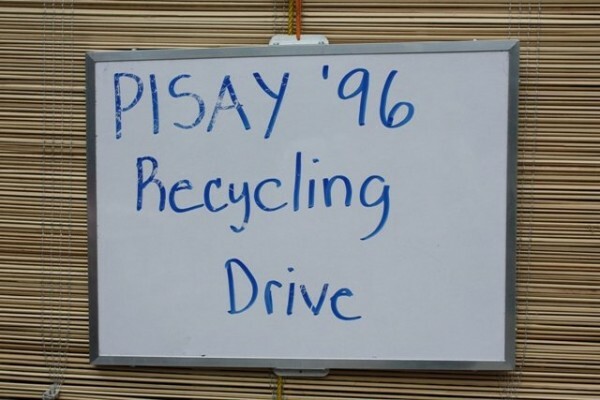 Click here for a short summary of the 1st Pisay 96 Trash Drive.